The chairs consist of a shaped top rail with carved foliate decoration, the back splat carved and pierced with foliate and scrolling designs, the shaped uprights with carved harebell decoration. 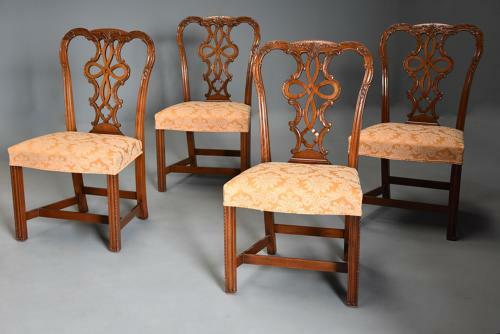 The seats are upholstered in a neutral damask style material in excellent condition (this can be easily changed once purchased if required) leading down to moulded and carved front legs with an H stretcher. The chairs are of a 'light' mahogany appearance, probably due to having been stripped and re-polished some years ago - we have not re-polished them as some clients prefer the lighter colour. This set of chairs are in excellent condition for age, are of stable construction and can go straight into a home.